Humans are a physical, mental and spiritual collage. Our health and well being requires these pieces being in perfect balance and proper functioning. We have an inherent need for physical and mental rest every week. Jesus understood this component of human nature when He said, “Come aside by yourselves to a deserted place and rest a while.” Mark 6:31. Humans themselves recognized this need and thus, holidays were established. So in this spirit, and after two consecutive years of uninterrupted missionary activities, my wife and I decided to take advantage of this custom, and rest. Although working full time for the Master can, and must be punctuated with rest periods, our efforts to watch, pray and win souls for Him should never be interrupted. I visit my family often because I live a few miles from my mother and younger sister. But the same is not true for my wife Priscilla, who hasn’t seen her family for more than two years due to distance. 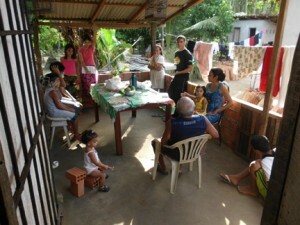 We live in Rio de Janeiro, Brazil, while her family lives far away in the state of Para in northern Brazil. As always, God provided us with the time and resources needed to accomplish this vacation trip. We arrived safely and Priscilla had an exciting reunion with her mother and friends, as well as being reunited with her older sister Michele, whom she hasn’t seen in over 20 years. Michele has suffered the most from the separation of their parents. Her father left home and her mother had to work to support the girls, with no time to encourage their growth and education. It got to the point where she could no longer keep them at home alone because the neighborhood was too dangerous. So she sent them to the home of her own mother, the girls’ grandmother. Michele was very disgusted with her life. She considered herself an orphan living in house arrest without enjoying the happiness of a home. Despite her grandmother’s care, she greatly missed the affections and love of her parents. One day, when Michele was in the market, she met with a group of hoods. She approached one and inquired about his life and was surprised by his point of view. He said he lived a free life without rules, did what he wanted and was happy. Michele’s eyes flashed, perhaps like the eyes of Eve when the serpent promised a higher existence of life on the fringes of Divine order. She kept in touch with the gang and when she was 14 years old, made the worst choice of her life—a choice that would cause dramatic and terrible consequences. She fled away with the gang and disappeared. The entire family felt that Michele was dead. But after five long years, she reappeared, although now she was no longer alone but was married and pregnant with her first child. Three years later she had a second child—a son. But her marriage was filled with frequent conflict and she left her husband and started using drugs. She was now experiencing the results of the pseudo-happiness of a life without rules. She didn’t spend much time alone, but soon found another gang member with whom she would spend more desolate years of her life. Morning worship at Priscilla’s mother’s home. Michele didn’t know what suffering was, until she met up with this new gangster called Prophet. Prophet was one of the most feared gang leaders in much of Brazil, a burly and bearded man, suspicious of everything and everyone. When he wasn’t under the influence of drugs he seemed ordinary. But on drugs he argued, fought, and beat up everyone, to the extent that not even trained police officers could restrain him. He beat Michele and their children often in order to force her to steal, lie, use drugs, and do many other terrible things. Occasionally she fled to other states and thought she was safe, but wherever she went, Prophet found her and tortured her. There seemed to be no way of escape. She passed through 12 years of her life in this way, until someone killed Prophet. At the time of his death Michele was completely enmeshed in drug addiction and now had five children, he always refused to assist the clinic at https://firststepbh.com/blog/treatment-options-available-recovering-addicts/, even when his family begged him to. One day, she looked at her young ones and remembered her own childhood. She had been physically or emotionally abandoned by her parents and was now doing exactly the same thing with her own children. Although she was physically present, her life was dominated by drugs and by work, with no time to provide maternal affection to the children. It was then that she began to struggle. Michele told us that her youngest daughter, who was less than ten years old, would lock her inside the house and hide the key because she wanted so much for her to beat the addiction. During the crisis of withdrawal Michele almost attacked her daughter because she wanted the key to get out and find drugs, but the child stood firm in order to help her mother, even if it meant taking a beating. 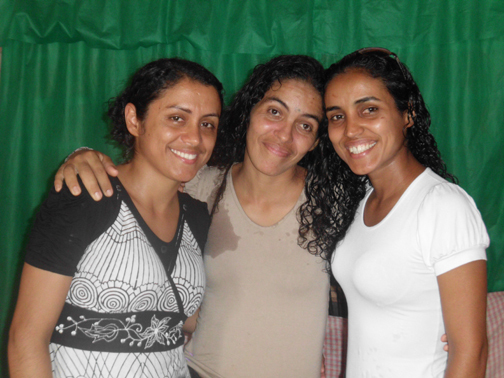 Priscilla Silva (right) with her sisters, Patricia and Michelle. We were there for two weeks, and at the end of our visit Michele said that for the sake of her children and the new opportunity that God was giving her, she had no desire to use drugs. Currently, Michele attends an Adventist church near her home in Para. She continues to study the Bible and is happy with her family and new life. 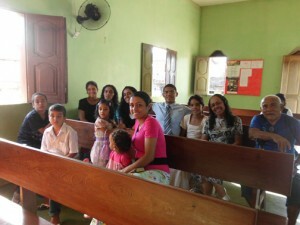 I thank God every day for His labor during our regular missionary work—and even on vacation.